The long-lost romantic memoir of Alma Reed, an American journalist and companion of Mexican martyr Felipe Carrillo Puerto. In the Yucatán, they never forgot Alma Reed. She arrived for the first time in 1923, on assignment for the New York Times Sunday Magazine to cover an archaeological survey of Mayan ruins. It was a contemporary Maya, however, who stole her heart. Felipe Carrillo Puerto, said to be descended from Mayan kings, had recently been elected governor of the Yucatán on a platform emphasizing egalitarian reforms and indigenous rights. The entrenched aristocracy was enraged; Reed was infatuated—as was Carrillo Puerto. He and Reed were engaged within months. Yet less than a year later—only eleven days before their intended wedding—Carrillo Puerto was assassinated. He had earned his place in the history books, but Reed had won a place in the hearts of Mexicans: the bolero "La Peregrina" remains one of the Yucatán's most famous ballads. Alma Reed recovered from her tragic romance to lead a long, successful life. She eventually returned to Mexico, where her work in journalism, archaeology, and art earned her entry into the Orden del Aguila Azteca (Order of the Aztec Eagle). Her time with Carrillo Puerto, however, was the most intense of her life, and when she was encouraged (by Hollywood, especially) to write her autobiography, she began with that special period. Her manuscript, which disappeared immediately after her sudden death in 1966, mingled her legendary love affair with a biography of Carrillo Puerto and the political history of the Yucatán. As such, it has long been sought by scholars as well as romantics. In 2001, historian Michael Schuessler discovered the manuscript in an abandoned apartment in Mexico City. An absolutely compelling memoir, Peregrina restores Reed's place in Mexican history in her own words. 7. Uxmal: "The Thrice Rebuilt"
Michael K. Schuessler is currently an independent scholar residing in Mexico City, where he writes on Mexican culture and literature. Life has so many chapters . . . The first time I heard of Alma Reed was in 1992, in the lobby of the Gran Hotel in Mérida, capital of the state of Yucatán. I had arrived after a twenty-six-hour bus ride from Mexico City, which included frequent stops in towns and villages along the way. Upon my arrival, I was immediately captivated by the once-imposing surroundings of the hotel, which, as I would soon discover, was a local landmark in the cultural and political history of the city. As the receptionist, Don Eusebio, handed me the key to my room, he mentioned that Fidel Castro had occupied my suite many years before, when he and his rebels were searching the Gulf Coast for a boat to take them back to overthrow Batista's Cuba. Encouraged by my interest, he rattled off the names of several other foreign celebrities who had once stayed there: Charles Lindbergh, Sergei Eisenstein, Douglas Fairbanks Sr., and so on until he happened upon a woman popularly known as La Peregrina. When I failed to show any enthusiasm, he quickly explained that La Peregrina was a gringa from San Francisco, California, whose name was Alma Reed. He was astonished that I had never heard of this locally revered figure, especially given that we were paisanos, or countrymen, and he proceeded to narrate the story of her tragic romance with the revolutionary hero and martyred governor of the Yucatán, Felipe Carrillo Puerto (1874-1924). Alma Reed met, fell in love with, and became engaged to marry the Yucatán's charismatic populist governor, known to his detractors as the "red dragon with eyes of jade," while on assignment for the New York Times Sunday Magazine in the early 1920's. Immediately after their formal engagement, Reed returned to San Francisco to gather her trousseau and make plans for the wedding. Although she had been previously married to Samuel Payne Reed, Alma was again in love and willing to face the consequences of this union, as Felipe was a married man. In January 1924, a week before the marriage was to take place, Alma received a telegram with devastating news: her fiancé, three of his brothers, and nine of their followers had been executed by a firing squad. Carrillo Puerto had fought alongside Emiliano Zapata for "Land and Liberty." In the spirit of the Mexican Revolution, the governor made great attempts during the early 1920's to modernize his distant state, whose land barons were members of la casta divina, the "divine caste." This landed aristocracy had steadfastly resisted agrarian reform and other social advances put into practice by the new constitutional government. In the Yucatán, these included the creation of feminist leagues, led by Felipe's sister Elvia, which instituted the first family planning programs with legalized birth control in the Western Hemisphere, as well promoting women's suffrage, which was obtained far earlier than in the rest of Mexico. The radical governor also founded more than four hundred local schools to educate Maya youth, until then virtual slaves held by debt peonage on the enormous henequen haciendas of the ruling class. Indeed the coat of arms of the all-powerful Montejo family, which adorns the facade of their sixteenth-century palace in Mérida, is composed of a Spanish foot planted squarely on the head of a Maya slave. In clear defiance of the status quo, the socialist governor revived the ejidos, or communal villages, characteristic of pre-Hispanic Mexico, arguing that the land of the Yucatán was the inhabitants' legal birthright. He also reformed the prison system and constructed roads into Mérida from numerous villages, so that farmers could transport their goods to the market more efficiently. Despite his towering height and green eyes, Carrillo Puerto was said to be a descendant of Nachi Cocom, the last indigenous cacique of the Mayapán federation, who in the mid-sixteenth century had steadfastly resisted the invading Spanish. Whatever the case may be, as a result of his childhood spent in the countryside and his regular contact with indigenous peasants, Carrillo Puerto was fluent in Yucatec Maya and in his youth even translated the Mexican Constitution so that the non-Spanish-speaking majority could know their rights. As a direct result of the socialist-inspired reforms enacted during his governorship, which lasted only twenty months, the first democratically elected governor of the Yucatán was murdered on January 3, 1924, along with his brothers Edesio, Benjamín, and Wilfrido and nine political confidants, including Manuel Berzunza, Carrillo Puerto's closest adviser. The assassins were agents of the Delahuertista rebellion, led by Adolfo de la Huerta and headed in the Yucatán by Colonel Juan Ricárdez Broca, from the northern state of Sonora. The Delahuertistas supported the efforts of the Yucatán's ruling class to regain the henequen haciendas and de facto slave labor they were forced to give up as a result of the Mexican Revolution. This once-privileged group, supported by the Catholic Church, openly challenged the presidency of Álvaro Obregón, Carrillo Puerto's staunch ally, and would later unsuccessfully attempt to overthrow him. Although de la Huerta condemned the executions the same day they occurred, shortly afterward Ricárdez Broca was promoted to general and named acting governor of the Yucatán. His provisional—and illegitimate—government was short-lived, due in part to the immediate response of the important Ward Line—its suspension of cargo service to and from the region paralyzed the henequen industry, whose revenues were the backbone of the local economy. y radiante caballera como el sol. bajo el cielo de mi tierra, de mi tierra tropical. te acarician en los labios, en los labios y la sien. no te olvides, no te olvides de mi amor. I immediately answered: "That perfume is because you are passing by and the earth, trees and flowers wish to caress you." "You shall tell that to Alma in verse." "I will tell it to her in a song," I answered. "I have your word," replied Felipe. Throughout my first visit to Yucatán, Reed's ghost would appear on numerous occasions, most often in this famous song but also in the collective memory of the emeritenses, residents of Mérida. As I would later discover, the images conjured up by the ballad "La Peregrina" aren't always pleasant, and during a recent interview with a granddaughter of Carrillo Puerto, she was quick to point out that her grandmother always changed the channel whenever the song was played on the radio, as it inevitably reminded her of that "gringa oportunista" who stole her husband's love. Ever since that first visit to the Yucatán in 1992, I have been captivated by this woman. Before becoming a living legend in Mexico, she had begun her journalistic career in San Francisco under the pseudonym "Mrs. Goodfellow," a columnist for the leftist San Francisco Call . Under this byline, she documented the tragedies and injustices suffered by the disenfranchised, earning her the dubious sobriquet of "sob sister." Reed's reputation as a champion of human rights and as a journalist was established in 1921 by her celebrated defense of Simón Ruiz, a seventeen-year-old undocumented Mexican worker who was sentenced to death by hanging after being advised by his state-appointed lawyer—in incomprehensible English—to plead guilty to trumped-up charges. As a result of Reed's campaign, which lasted several months and produced many impassioned articles in the Call , the state laws of California were amended to prohibit the execution of minors. The law, passed in 1921, was popularly known as the Boy Hanging Bill. The legal amendment attained as a direct result of Reed's efforts is a clear case of how journalism could lead to tangible advances in government and society, and Reed was a visionary in this sense. Indeed her absolute support of Álvaro Obregón's revolutionary government, as reflected in several articles written for the Times as well as the Hearst papers (under a pseudonym), would soon result in the official recognition of Mexico's new government by the United States. Given her defense of the disenfranchised, which, in the case of Ruiz, resulted in a major change in the California legal system, it may be argued that Reed heralded a type of reporting that had nothing to do with the antics of "daredevil girls" such as Nellie Bly, popular at the time. This was in part thanks to Fremont Older, "who gave newspaper women extraordinary opportunities on the San Francisco Call Bulletin and backed them in many original exploits, and believed that editors did not employ enough women." Reed's crusade to save Simón Ruiz attracted the attention of Mexico's new revolutionary government, and in September of 1922 Reed traveled to Mexico City for the first time as the semiofficial guest of President and Mrs. Álvaro Obregón. Upon her arrival, Reed was treated like royalty; her suite at the elegant Hotel Regis was festooned with flower bouquets and caged songbirds, while a chauffeur waited outside to take her to her various official engagements, which included a trip to the pyramids of Teotihuacán, tours of the schools constructed by the new government, and luncheon with the president and first lady at their residence in the former castle of Emperor Maximilian and Empress Carlota, perched atop Chapultepec Hill. At the time, Mexico had just emerged from a revolution that had left thousands dead but that, upon its triumph, had distributed arable land to the peasant population, for this had been the greatest demand of the landless majority. The new government was also attempting to overcome a long history of educational neglect and undergoing a cultural transformation spearheaded by Secretary of Education José Vasconcelos. It was said at the time that just as the revolution had handed over large tracts of land for cultivation, Vasconcelos had given to the artists enormous public walls to adorn with images of such changes. This official sponsorship gave rise to the Mexican mural movement, whose main exponents (Diego Rivera, José Clemente Orozco, and David Alfaro Siqueiros) would soon transcend Mexico's borders. Upon Reed's triumphant return to San Francisco, Adolph Ochs Sulzberger, owner and editor of the New York Times , contacted her at the Call , where she had gone back to work. Like many journalists of the time, Sulzberger had followed Reed's successful campaign to change California's capital punishment law, and he now wanted her to write for his daily. The two met face-to-face, and the newspaper magnate offered her the position of California correspondent. Duly flattered but having been bitten by the bug, Reed explained that what she really wanted was an assignment that would take her back to Mexico. Sulzberger was surprised by such a request, especially as she was then enjoying a growing visibility in the United States. However, he had also come to California looking for someone to cover an important upcoming archaeological expedition to the Yucatán. After a series of brief negotiations, Reed was hired to cover the Carnegie Expedition to the Yucatán Peninsula, where she would document the activities and discoveries of American archaeologists, including Harvard Mayanist Sylvanus G. Morley. His plan was to excavate the ruins of the classical Maya city of Chichén Itzá, located on the former henequen hacienda owned at that time by legendary American explorer and archaeologist Sir Edward Thompson, who had lived there with his family since 1885. As Reed recalls in her autobiography, Thompson considered her to be "simpática," and he admired her professionalism and work ethic. Soon after, he would choose Alma as his confidant, revealing to her that over the years he had dredged up countless treasures from the sacred cenote, or sinkhole, of Chichén Itzá and had gradually sent them back to the Peabody Museum at Harvard University via diplomatic pouch. When Reed's exclusive story broke in the New York Times on April 8, 1923, under the title "The Well of the Maya's Human Sacrifice," the taking of the artifacts at once became an international event. Mexico demanded repatriation of the items or the payment of a large indemnity, and Reed actively championed this petition. Nearly ten years later, in 1930, the Peabody Museum reluctantly returned a portion of Mexico's national treasure, largely as a result of Reed's efforts in journalistic and legal circles. It was also upon her first visit to Mérida, in February 1923, that Reed became enamored of the Yucatán's governor, Felipe Carrillo Puerto. 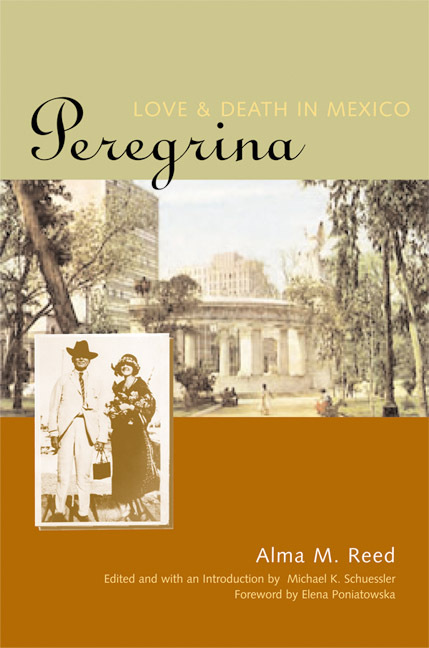 Their passionate romance would last for less than a year but would leave an indelible mark on the life and work of La Peregrina and also on the history of twentieth-century Mexico. A Carnegie Trustee and the senior member of the group, he voiced what was obviously the amazed reaction of his fellow expeditionaries when he whispered: "This is the most personable red dragon I've met with in any of my safaris . . . What do you think, young lady?" With total conviction, I unhesitatingly answered: "He's my idea of a Greek god!" With all tenderness I send you greetings and I hope that you realize how desperately unhappy I am that you are not at my side. I have no one to comfort me, nor the slightest caress. Receive all the kisses from my lips and all the love from this poor man who is thirsting for happiness. Yours until death. Underlining his pressing situation, at the bottom of the typewritten letter, which had been interrupted by a bomb that exploded nearby, he scrawled: "Communicate our matters by aerogram until I can send you a code." In the notes for Katherine Anne Porter's unpublished novel Historical Present, "a full history of a period as seen by certain people that moved through it," the author records Reed's "dramatic account of how she was standing by what chance she never explained in the hotel lobby, in full white satin with veil and orange blossoms rehearsing in her wedding dress, when the news came of Felipe's death." The novelist "was both envious and contemptuous of Reed's notoriety," according to Thomas Walsh, Porter's biographer of her Mexican sojourn: "In fragments of Historical Present , a novel she was working on in 1930, she planned to begin with Reed's 'cashing in on Felipe's death' and go on to her gradual building up the legend to become 'patroness of all Mexico.'" This hurtful remark, as well as the women's shared romantic interest in Carrillo Puerto, explains why Reed never attended Porter's well-publicized lectures in Mexico City during the 1950's and 1960's. After Carrillo Puerto's assassination in January 1924, Reed traveled to North Africa, again as a correspondent for the New York Times , and reported on the archaeological excavations in Carthage led by Polish count Byron Khun de Prorok. A series of five articles, bearing such intriguing titles as "Science Ferrets Out Carthage's Secrets," "'Curse' Still Hovers over Carthage," "Science Hunts for the Lost Atlantis," "Under-Water Camera Films Ruins of Deep," and "Explorers Seek Traces of African 'Joan of Ark,'" appeared in the New York City daily from October to December 1924 and bear witness to Reed's renewed interest in classical studies, an area that had fascinated her since childhood. While studying archaeology for a year in Naples, Reed translated G. Consoli Fiego's archaeological treatise, Cumae and the Phlegraean Fields , which was published in Naples in 1927. She later traveled to Greece as a guest of her childhood friend Eva Palmer, wife of the Greek poet Angelo Sikelianos, and translated Sikelianos's works as The Delphic Word . . . The Dedication , published the following year. During this period, Reed continued to write for the Times and in 1926 published two articles dedicated to one of the greatest mysteries of the Greco-Latin world: "Virgil's Hades Gives Up Its Secrets" and "Sibyl Renews Her Challenge to Man." While in Athens, Reed participated in the first Delphic Festival, which was organized by Palmer and Sikelianos in May 1927 as a way to return Greek culture and traditions to their rightful heirs. Inspired by this Hellenic spirit, Reed and Palmer traveled to New York later that year to found the Delphic Society's first colony in the United States. In early 1928 they moved into an apartment once occupied by celebrated Russian author Maxim Gorky, located at 12 Fifth Avenue. The flat, near Washington Square and its triumphal arch, was baptized "the Ashram" in homage to the "apostle of pacifism," Mahatma Gandhi, whom both Palmer and Reed greatly admired. Like Gandhi's settlement, Reed's New York apartment was the center of communal activities while also serving as headquarters for a cultural movement born of ancient philosophy, both Eastern and Western. Eventually Reed's Delphic Studios Gallery would emerge as the most enduring product of their initial collaborative effort. Unfortunately, only a few photographs survive that evoke the cosmopolitan atmosphere of their innovative literary and political salon. One day in 1928, Reed received a telephone call from Anita Brenner, a young woman from Aguascalientes who shared her fascination with Mexico and whose parents had immigrated to San Antonio, Texas, at the beginning of the Mexican Revolution. Later, Brenner would return to Mexico on numerous occasions, first to complete research for her well-known books, which included her study of religious syncretism and Mexican art, Idols behind Altars , published in 1929. During their conversation, Brenner informed Reed that the artist José Clemente Orozco had been living in Manhattan since December 1927 and was a bit down on his luck. During Reed's second visit to the Mexican capital, in 1923, when she and Carrillo Puerto were the toast of the town, Secretary of Education José Vasconcelos showed Reed the murals then being painted by Diego Rivera in the Public Education Secretariat, as well as those recently begun by Orozco in the National Preparatory School. In her 1956 biography of Orozco, Reed remembers that as she and Vasconcelos "approached the main patio of the preparatoria, where Orozco was engrossed in the decoration of a high vault, Vasconcelos called up to him: 'Orozco, this is the North American periodista (journalist), Alma Reed. She likes your painting. I don't! It's the worst yet. But it's your wall, hombre, not mine, so go ahead.'" Surely Orozco's powerful images of peasant struggles, warring revolutionary factions, the dissolute upper classes, and ruthless critiques of the Catholic Church made a great impression on the young journalist, and statements made during her first visit reveal a budding fascination with Mexico. In an interview with one of the capital's most important dailies, Excélsior , Reed announced: "Mexico should be the Mecca of all the world's artists: here every object and every scene is an occasion for art and beauty." This developing interest would soon lead her to join the ranks of other North American women who arrived on the heels of the revolution, including Katherine Anne Porter, Ione Robinson, and Frances Toor, founder and editor of the magazine Mexican Folkways . Although their activities have yet to be fully documented, these women were all actively engaged in important cultural endeavors during a period referred to as the Mexican Cultural Renaissance, when the artistic and educational ideals born of the revolution were being put into practice. The other day Anita [Brenner] told me that there are possibilities that I might sell a drawing and a small picture of those I have made here. Apparently, a Miss Alma Reed, who was the fiancée of Carrillo Puerto, the governor of the Yucatán who was killed, likes my works a lot, but naturally I was not introduced to her. Ms. Reed is a close friend of [José Juan] Tablada, but that cad hasn't introduced me to her or to anyone else. I have just received a letter from Alma Reed, whom I haven't met, but who is a friend of Tablada and the person Anita [Brenner] showed my drawings to a few days ago. She tells me that she has been a profound admirer of mine for a long time, and that "The entire series on the Mexican revolution holds a very intimate appeal to me, but one of them, 'Cemetery Scene,' is irresistible," and she includes 20 dollars towards the $100, which is the price of the drawing. She wants to come to my studio with a friend to talk about the publication of who knows what. My luck is changing a little bit, Miti. From your mouth to God's ear! After visiting Orozco at his improvised studio for the first time, Reed recalls: "The next morning I resolved to help the Mexican painter pursue his career in the U.S. I did not try to rationalize the inner compulsion that had shaped my decision." She also confesses: "I had no precise idea as to what I might do—if anything at all—to further his career in New York. But I could at least buy a picture, perhaps induce my friends to do likewise." On Sunday night, Anita introduced me to Alma Reed, who is a lovely woman and seems quite cultivated. She says that she is a great admirer of my work. She told me that she wants to illustrate a book she is writing with some of my Revolutionary drawings, and that tomorrow (Thursday) she will come to my studio with a woman she says is involved in some 40 magazines, in order to see my works, and that perhaps there will be business, that she wants a poster to announce some festivals in Delphos, Greece, patronized by a woman millionaire, that is celebrated every two years and is attended by people from all over the world. She says that there is some kind of group of literati and philosophers I will be presented to next winter, with a conference and projections of my paintings, and that they have spoken about me to all of their friends. Soon afterwards, Reed convinced her friend Eva to commission a portrait of herself from the painter, who set up his easel in a small room of the Ashram that he dubbed "the Pulquería," in honor of the notorious Mexican watering holes. As Reed recalls in her biography of Orozco, first published in Spanish in 1955 by the Fondo de Cultura Económica, the artist later painted odd pieces of homemade furniture and completed two canvases for the decoration of what he called the Ashram's "Mexican Sector." He also painted Reed's portrait but soon destroyed it in a paroxysm, provoked by what he considered to be a far superior rendering by Lebanese poet and engraver Kahlil Gibran, another famous habitué of her salon. The latter's admirable likeness includes the following dedication: "For Alma Reed: My dear and gracious friend, whose heart dwells in the world of truth and beauty. K. G. 1928." When I met [Alma Reed] and Mrs. Sikelianos, they were living in a spacious place on lower Fifth Avenue. They had come to New York to secure financial aid for the cause of Greece's resurgence and to organize an excursion to the festivals that were celebrated every two years in Delphi. . . . The literary-revolutionary salon of Mrs. Sikelianos was extremely well attended. Some days the Greeks came, among them Doctor Kalimacos, patriarch of the Greek Church in New York. There one heard Modern Greek spoken to perfection by the owners of the house. On other days bronze-colored Hindus with turbans arrived, champions of the cause of Mahatma Gandhi. . . . Alma Reed recited her translations of Sikelianos's epic poems, some of which had already been collected in a volume entitled The Dedication . The interest in your exhibit grows. Yesterday we had several very important people here, some of whom are returning today with the owners of galleries and with wealthy prospective purchasers. We feel that in view of this continued interest that it would be wiser to keep the exhibition here until Friday night. There is likelihood too of some portrait orders, so we think that it would be well to have your marvelous portrait of yourself here. Several very distinguished critics who viewed your work yesterday made the same comment independently and quite spontaneously: "Orozco's grouping and anatomy would pass for that of Michel Angelo." I have never seen such enthusiasm aroused by the work of any artist as was shown here yesterday. Many of our guests on Monday telephoned us yesterday to express their profound admiration again. . . . There will be interesting developments, I am sure, in regard to your work very soon, for so many influential friends are deeply interested now. We are working towards obtaining a "pretty wall" for you at the "Architectural Exhibit" in January. There will be some heads of galleries here today, including Marie Sterner. I think that I shall have some news for you tomorrow evening. The success of his first show led to a two-week exhibition of his Mexico in Revolution series, curated by the upscale Marie Sterner Gallery. The show opened on October 10, 1928, and, according to Orozco, Reed herself paid for the framing of his canvases as well as the printing and mailing of exhibition catalogs. Unfortunately, most of the guests had attended the opening in deference to the gallery owner, and they appeared more interested in Sterner's Biederman furniture than Orozco's revolutionary canvases. According to Alejandro Anreus, author of Orozco in Gringoland , "much to the disappointment of Reed and Orozco, the exhibition received no critical notice, and not a single work was sold." However, as Orozco himself points out in another letter to his wife dated October 11, 1928, Mrs. Sterner asked that his drawings not be sold, as they would "cause a sensation" in Paris, and asked Mrs. Sikelianos to take the "entire collection of drawings" with her to Europe on her upcoming trip. Clemente [Orozco] met Alma Reed on November 10, 1928, quite by coincidence. Alma Reed is an Antonieta who never met a Rodríguez Lozano: all goodwill and disorientation. Until then, Cleme[nte] had done nothing. Alma, who is well connected, embroiders her tragedy with Carrillo Puerto with red thread and thus holds great interest in Mexico. Clemente, a Mexican, unprotected and brilliant, allowed her to avenge herself over Mexico, which killed her Carrillo eight days before the wedding. She adopted him, and the last three or five days has done nothing but create a reputation for Orozco in the United States: articles, exhibitions, lectures, etc. She has now rented a flat on Fifty-seventh Street, where all the best art galleries are, half a block from Fifth Avenue, where she will open a gallery (Clemente mentions it sotto voce) that will be dedicated to Orozco. He is going to paint a fresco on the façade that will be visible from Fifth Avenue and in February will hold an exhibition (it's the best month). The Delphic Gallery was founded by Alma Reed, who, as a buxom and attractive blonde reporter for some press organization, had found herself in Mexico at the time of the first successes of the Mexican School of painters. Alma envisaged a resuscitation of the Greek mysteries of Delphi in a new and modern form. This was considerably too esoteric for me, but because Alma had the Mexican painter Clemente Orozco in tow and because I had great admiration for his work, I joined her organization. There is an extraordinary woman by the name of Alma Reed, who has a gallery called the "Delphic Studios"! She is going to sponsor Orozco. Mrs. Reed originally came from California, and I'm afraid that she carried with her some of the mystic ailments that sometime befall the people out there. Mrs. Reed is a very fat woman and wears long black dresses, but she has the face and hands of a Madonna! She belongs to a secret Greek order called the Delphic Society. (I only hope that she concentrates on selling Orozco's work!) The other night she invited me to one of the meetings of the Delphic Society. A Mrs. Hambridge, the wife of the man who is supposed to have discovered Dynamic Symmetry (a system of drawing mathematical forms), was there, dressed in white veils, and she wore Greek sandals. The rest of the people (all women) wore long chains with Greek crosses. The lights were dimmed—and the discussion of "Art on a Higher Plane" commenced. I was really frightened. When Mrs. Reed is talking, she waves her hands in the air and the words go up and down, all according to the dramatic incident she is recalling. The most dramatic part of her life was her engagement to Felipe Carrillo Puerto, the martyred governor of the state of Yucatan, Mexico. But in spite of her foolishness, Mrs. Reed has a rare quality. No matter what cause she is devoted to, she makes the most of every moment in order to arrive at some climax. She is determined that Orozco will paint a fresco in New York, that his genius will be recognized, and that with his recognition, Diego Rivera will fall into oblivion. The stock market crash of 1929 caused an abrupt decline in the art market, of course, but it did not mean the end of Reed's first venture into the gallery business. Indeed, on October 15, 1930, Reed's Delphic Studios presented Edward Weston's first solo exhibition in New York City. The idea had been born during a trip to Carmel, California, where Reed and Orozco met the young photographer—recently back from his Mexican sojourn—and where Orozco posed for Weston's now-famous portrait of the artist. According to Orozco, Weston was "the first surrealist photographer," and there he proposed the idea of an exhibition in New York. Later that year Orozco himself hung the fifty photos making up the show. Reed would exhibit the work of other up-and-coming American photographers at her Fifty-seventh Street gallery, including that of Ansel Adams, who later complained that he never was paid for the eight prints Reed sold for him. At this time, Alvin Johnson, founder of the New School for Social Research, had raised enough money for the erection of a building for the school on West Twelfth Street near Fifth Avenue. Hearing of this, Alma visited Johnson and offered Orozco's services as a muralist. They were accepted. Orozco would paint a mural for the New School's dining room for the expenses of execution. The work was inaugurated on January 19, 1931, and its principal mural was entitled Table of Brotherhood .